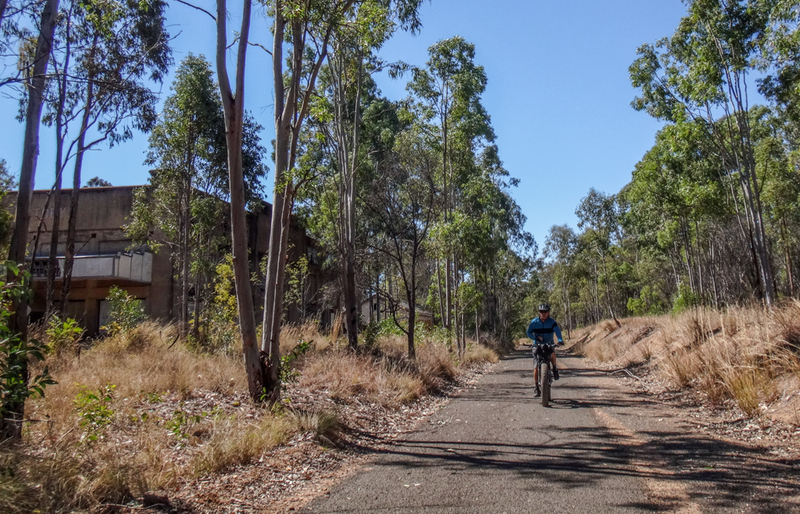 Last week we rode the smooth paved South Burnett Rail Trail to Murgon. Today we wanted to find a rougher off-road route. 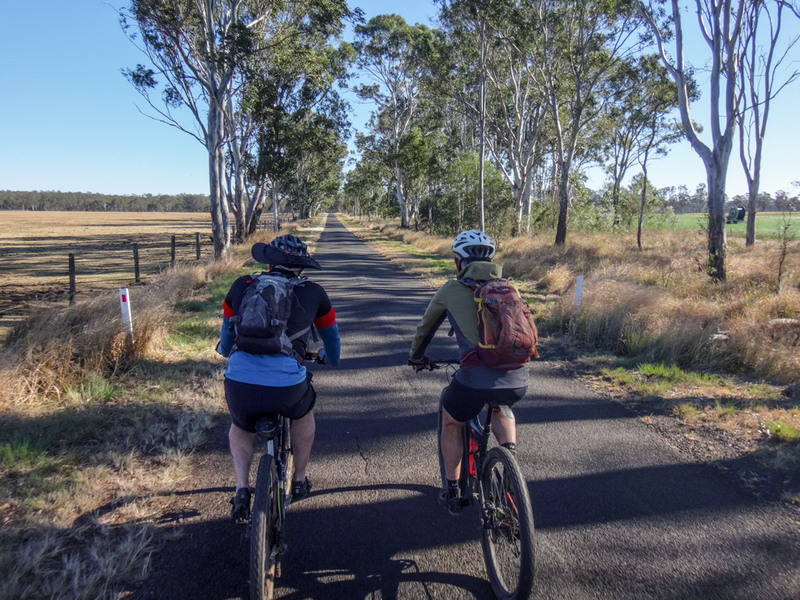 We started on the outskirts of Nanango and rode north along quiet back roads that went straight and flat through lush farm fields. 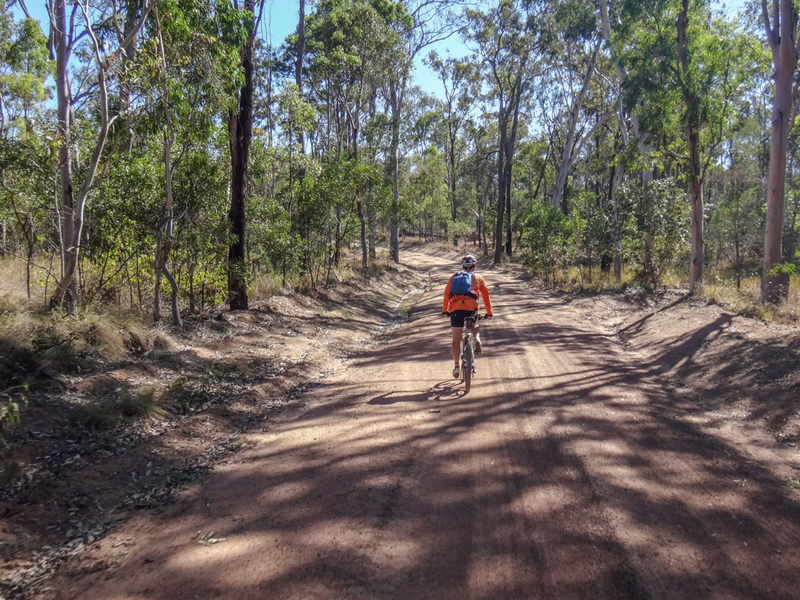 Mountain bikers prefer dirt roads and tracks instead of paved. 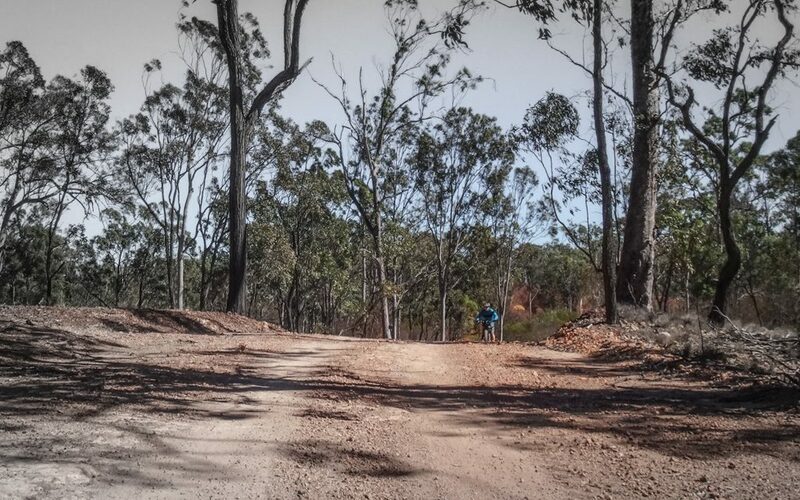 We were glad when the bitumen ended and the gravel began on Booie Road. 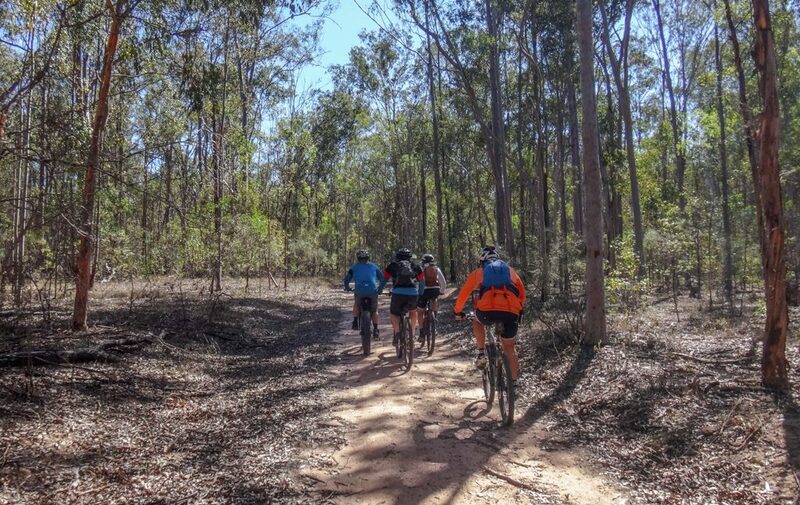 One day soon a few of us would like to ride through the bush for 3 or 4 days, mostly following dirt tracks and gravel roads. We think an ideal route might be to follow the Brisbane Valley Rail Trail from Ipswich to Yarraman, the South Burnett Rail Trail to Kilkivan, then quiet back roads to Gympie. The only problem with this plan was about forty kilometres of paved roads between Yarraman and Kingaroy, and 45 kilometres of paved paths along the rail trail to Murgon – not ideal mountain biking terrain. 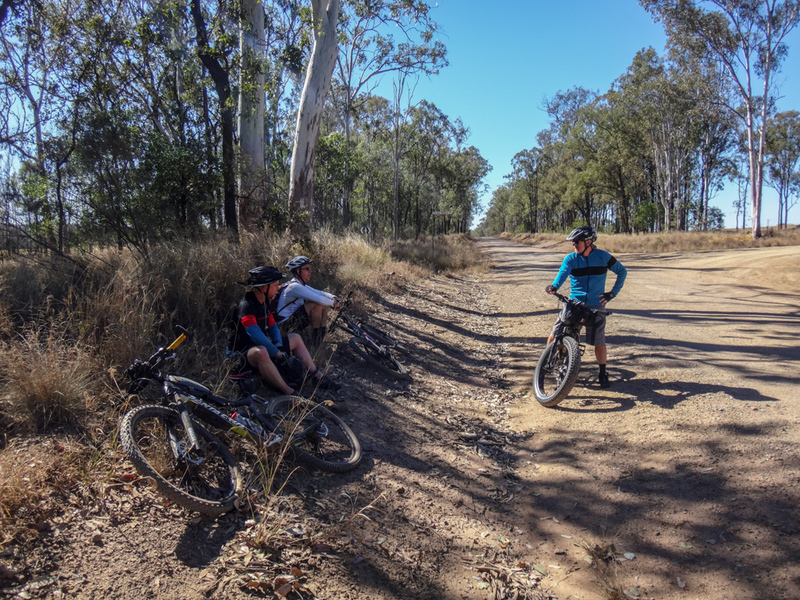 We thought a more suitable route for Mountain Bikers would be to follow on old stock route from Yarraman to Nanango, then somehow get to Wondai or Murgon through the bush. 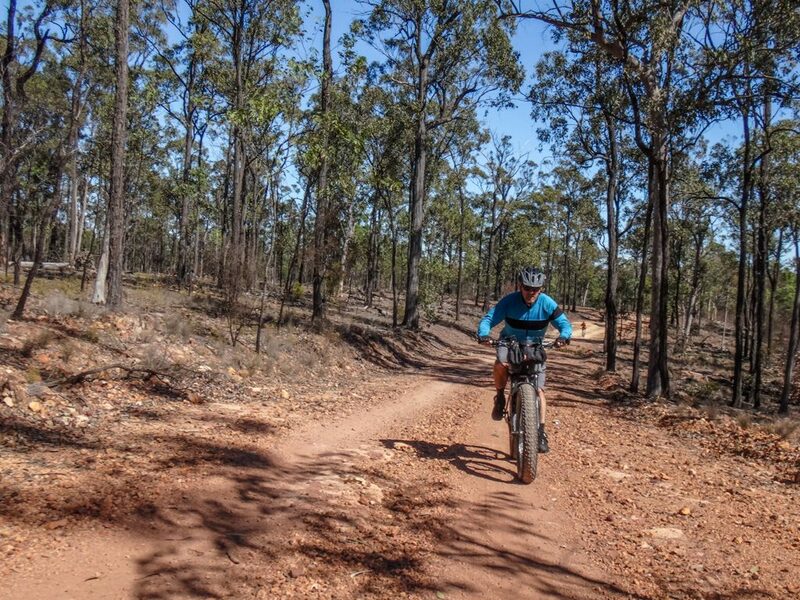 That was the aim of today’s ride: How to get to Wondai or Murgon on dirt? 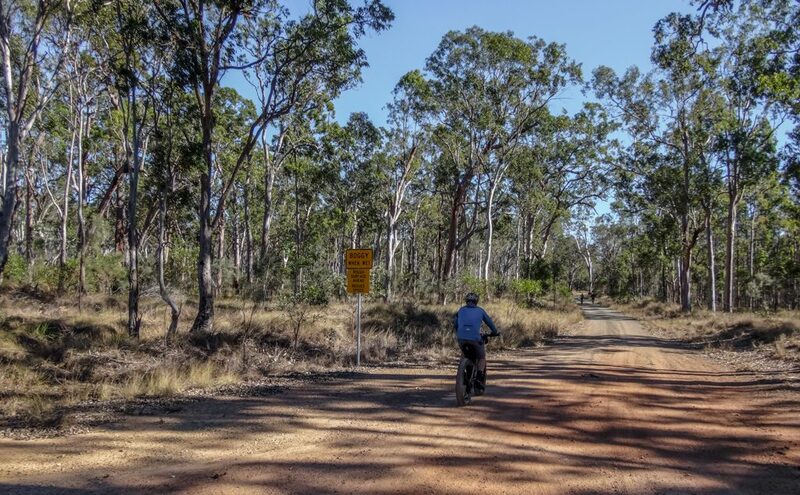 “Boggy When Wet” – at the end of Booie Road, a sign warned us of the heartbreak and frustration we might face in wet weather. 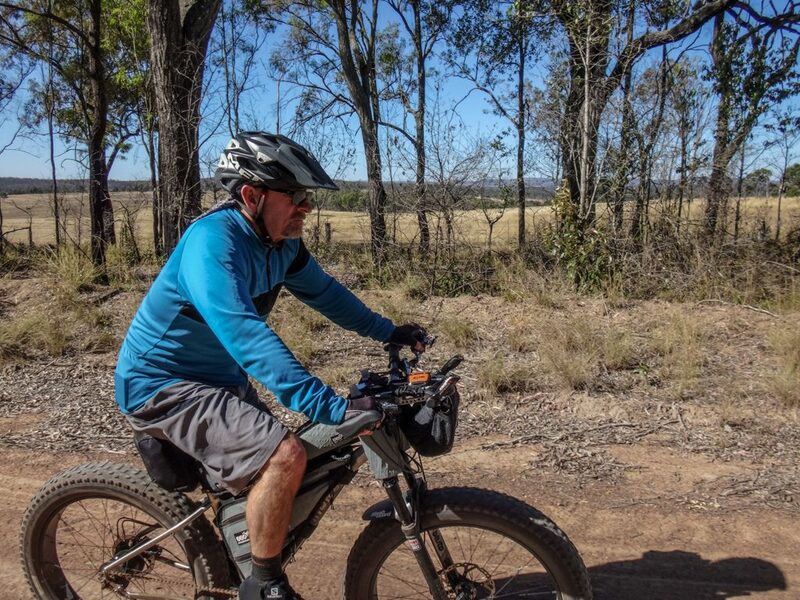 We’ve battled black-soil mud before – so thick that you can’t even push your bike through it without the wheels clogging up. This would definitely be a dry weather route. There was no mud today. This gentle late-winter day provided the perfect environment for a long ride. 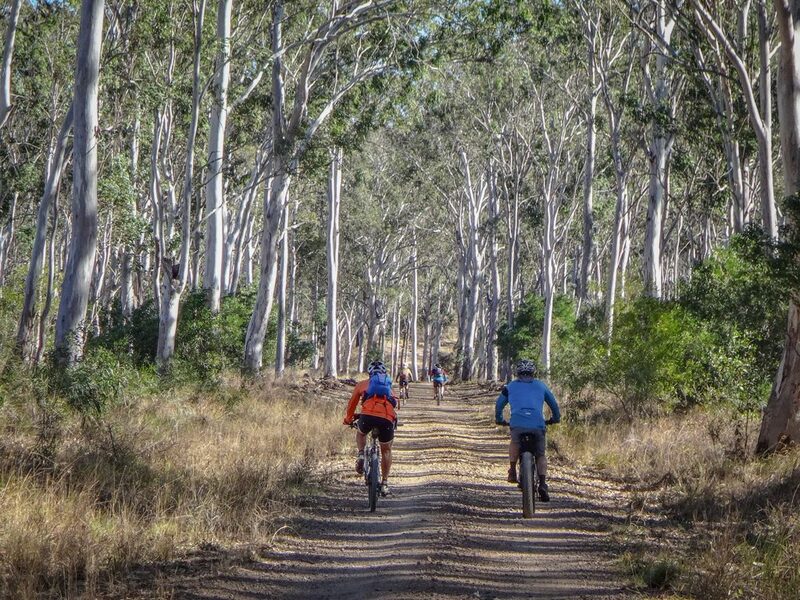 We pedaled through endless miles of eucalyptus forest along reasonably flat roads. This was perfect. After almost an hour, we stopped in the shade of a few trees for a quick break. There were no shops out here. The only morning tea available was what we could carry with us. 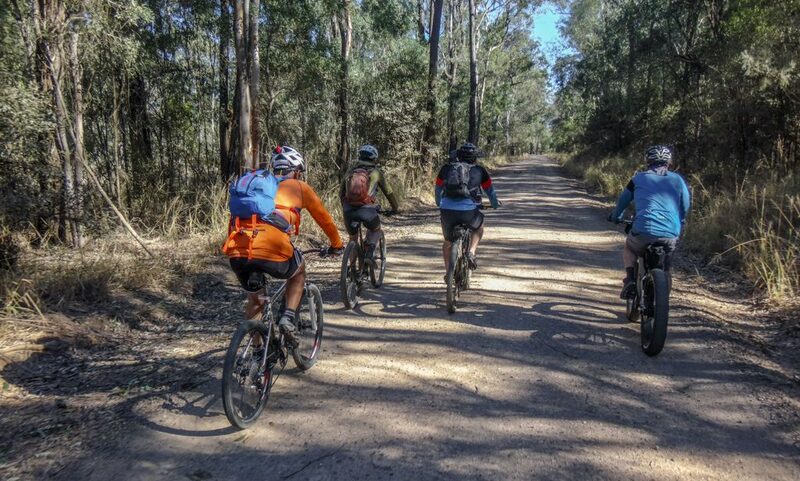 At Wondai State Forest we left the gravel in favour of long straight fire trails between the trees. 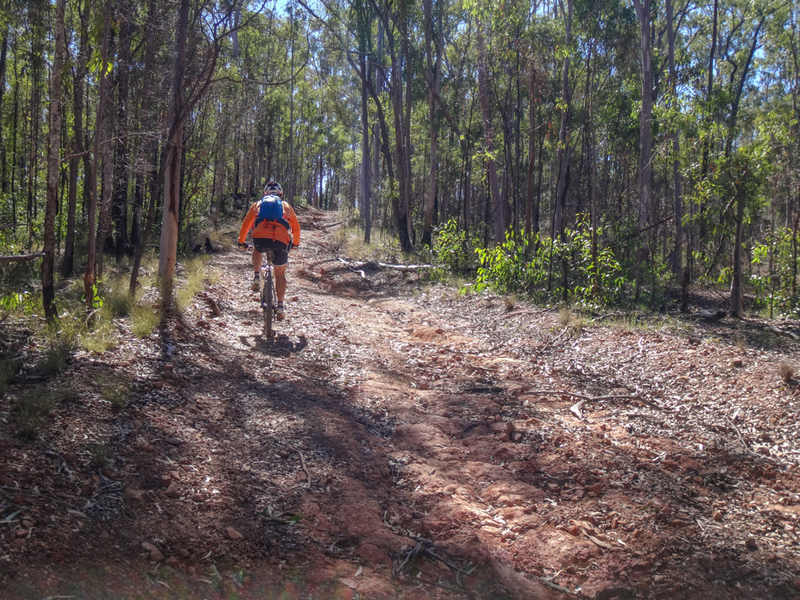 We had ridden here last week, and I was eager to return and explore more tracks. 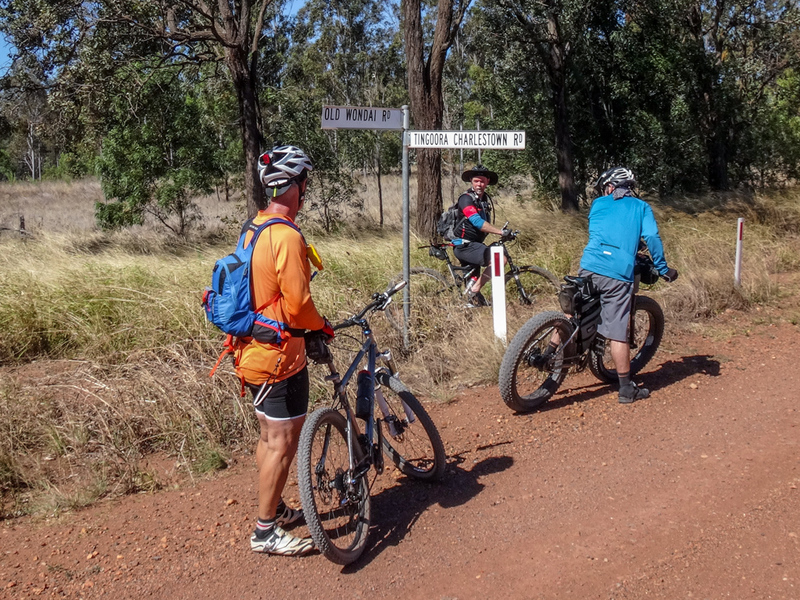 Last week we had just followed the trails into Wondai. Today we turned right and explored some steeper trails that led off towards Cherbourg. At the top of the hill we found a bit more shade and stopped for another quick break. 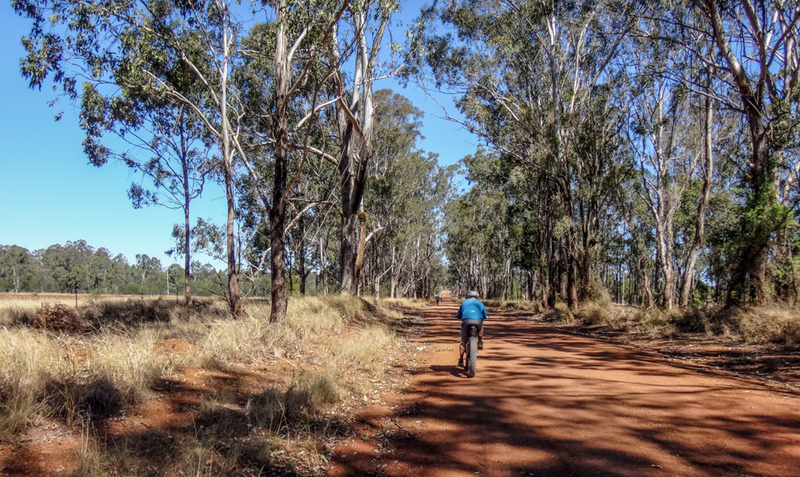 Closer to Cherbourg, the hills are covered with eucalyptus and bright red dirt. 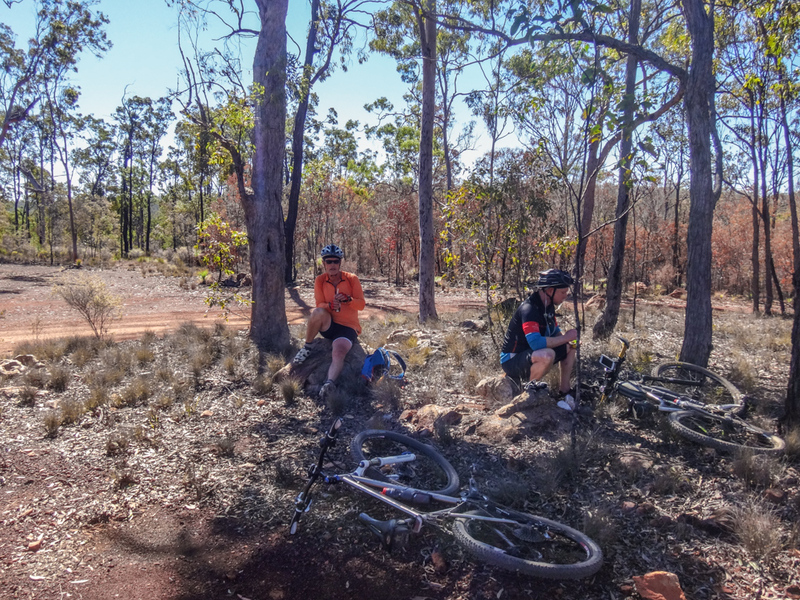 We figured if we emerged from these bush tracks at Cherbourg, it would only be a short six kilometre road ride into Murgon. We reached the outskirts of Cherbourg as planned. 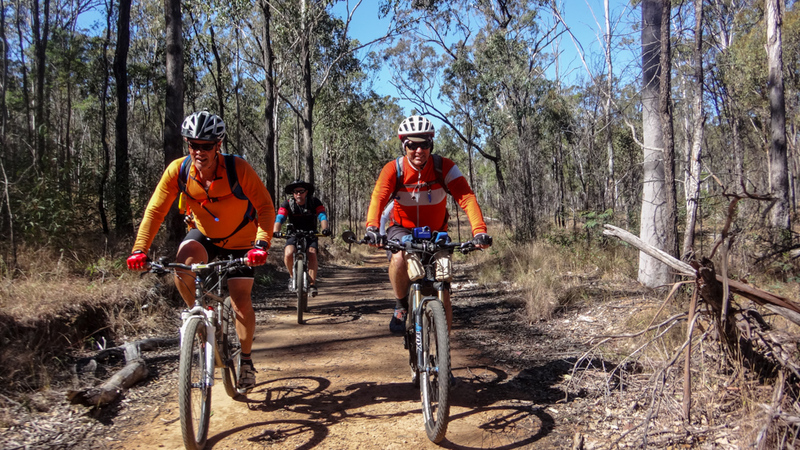 It had taken us under three hours (including breaks) to ride 44km from the outskirts of Nanango. 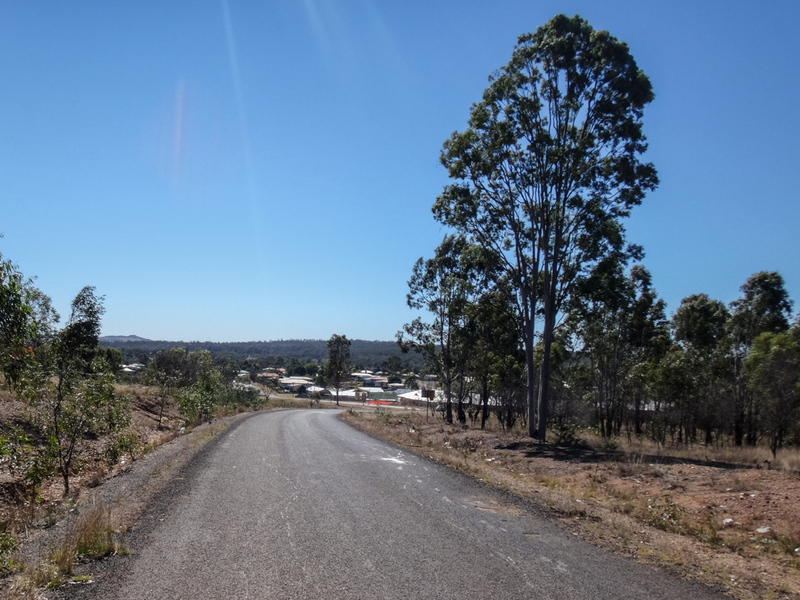 Rather than continue into Murgon, we thought it would be a good idea to find a similar route between Nanango and Wondai. 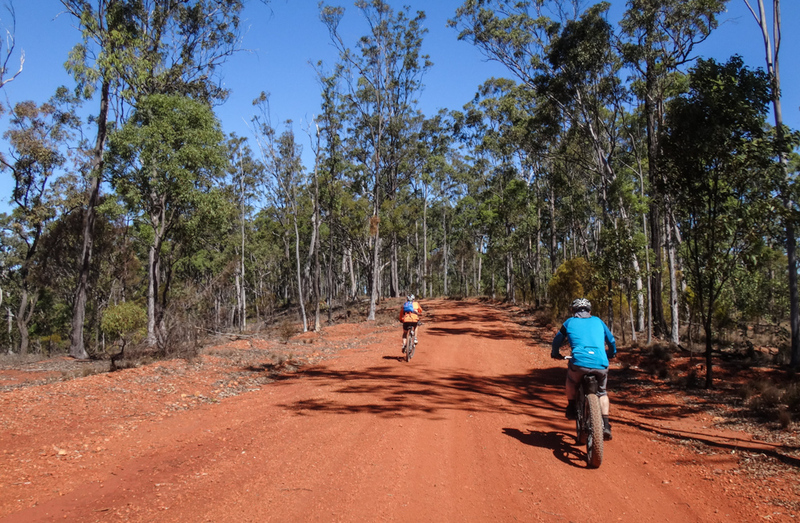 We followed the bright red dirt ribbon of a road through the forest to Wondai. 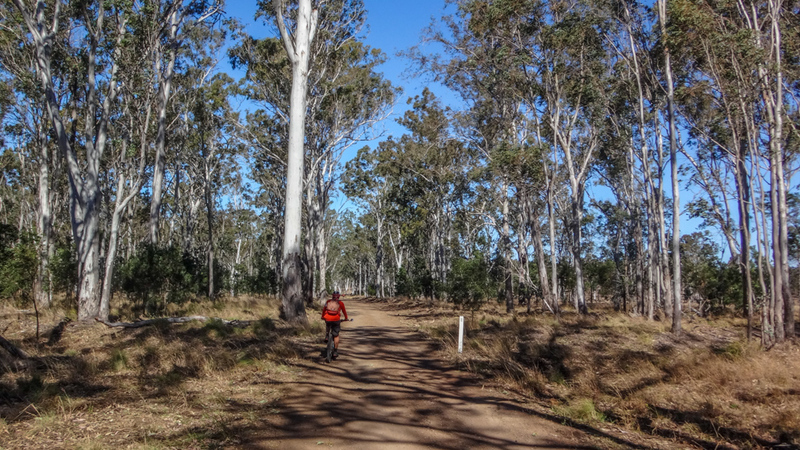 Forty minutes later we emerged on the South Burnett Rail Trail north of Wondai. 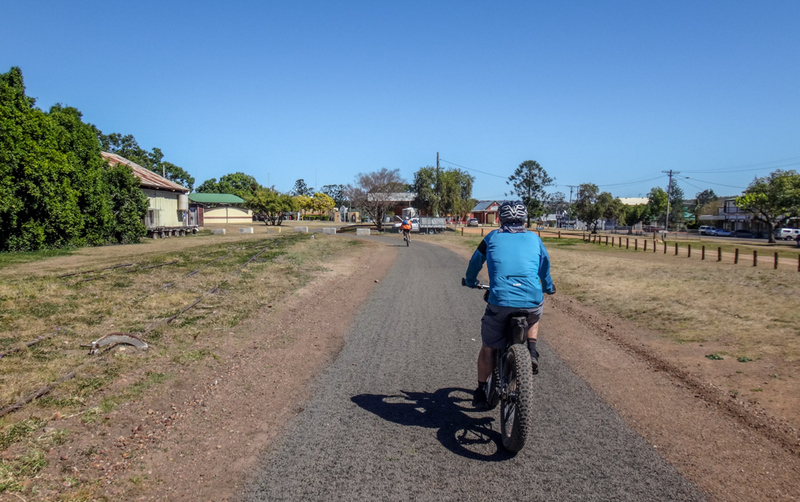 After a brief lunch break at the local bakery, we rolled homewards towards Nanango. 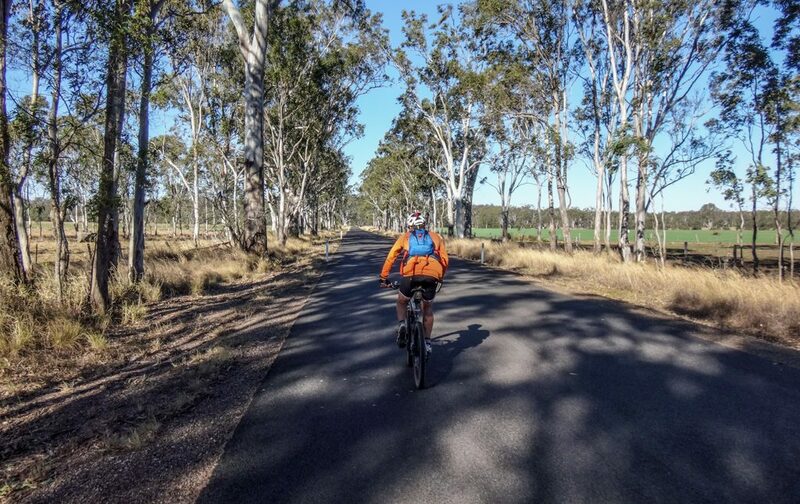 The South Burnett is full of delightful long, straight roads. 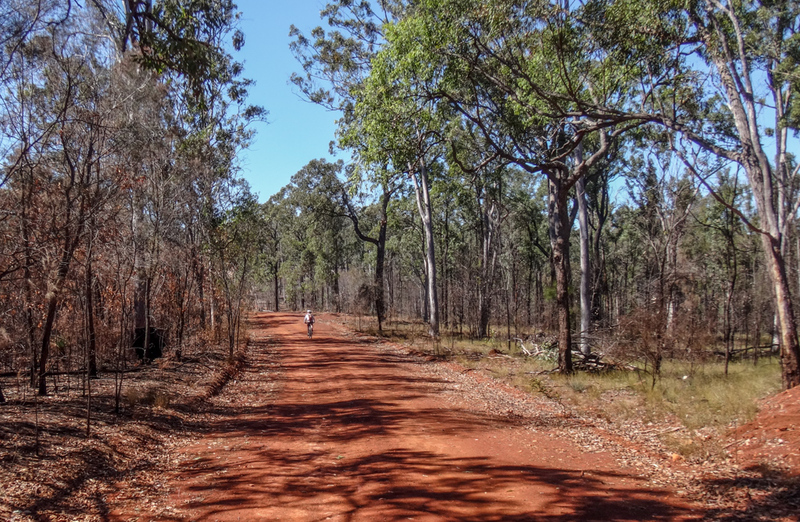 The ochre track seemed to go on forever between walls of gum trees. 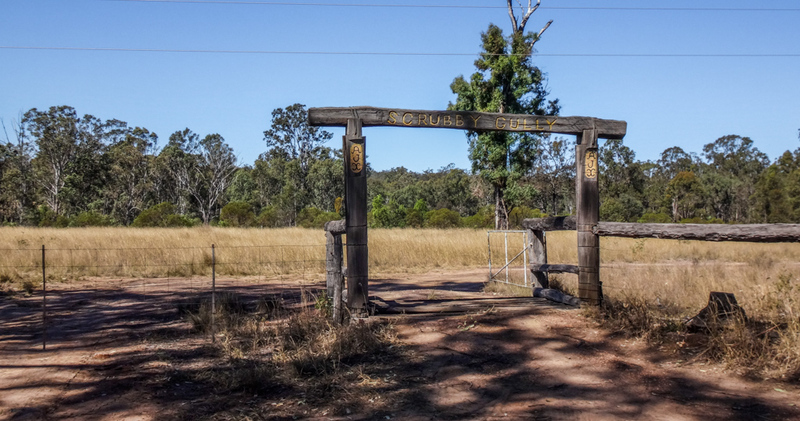 We followed Old Wondai Road south past dozens of farms. I checked the GPS. 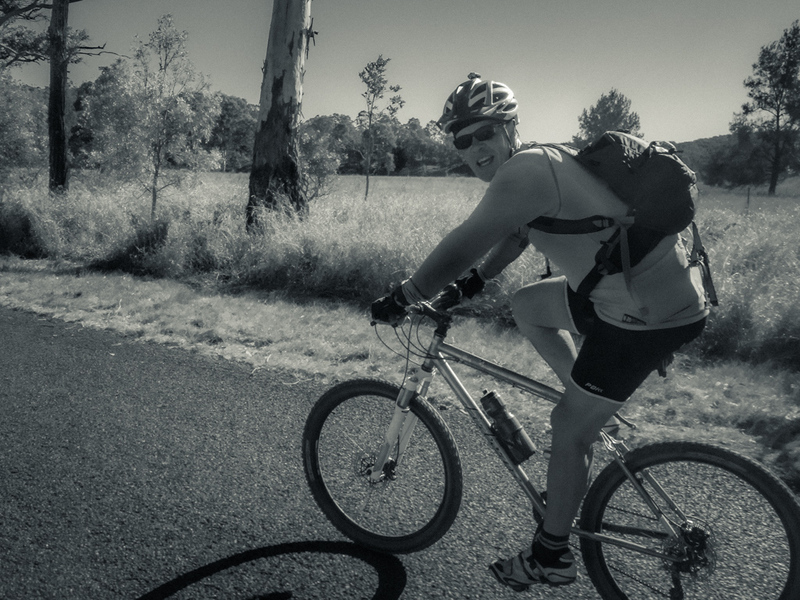 Sixty-five kilometres down, thirty-odd to go. No wonder I was feeling tired. My riding buddies stopped to let me catch up. Halfway along, Old Wondai Road gets a bit hilly. It’s not overly steep, but after riding all day my legs started to complain. Darb slowed down and rode with me. It was windy. The south-westerly blew up the road meeting us head-on. 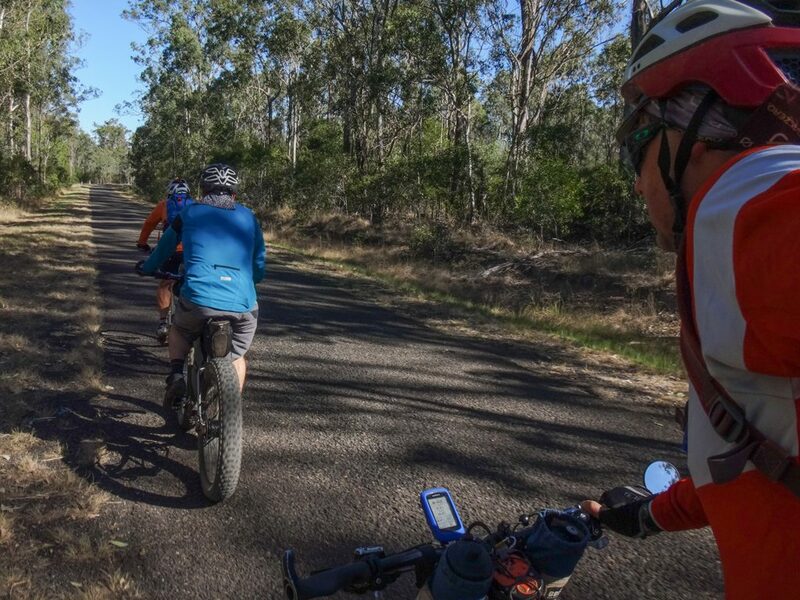 When we reached the bitumen, we bunched up like “roadies”, sheltering from the headwind behind the rider in front like they do in the Tour-de-France. My toes ached. My bum was burning. 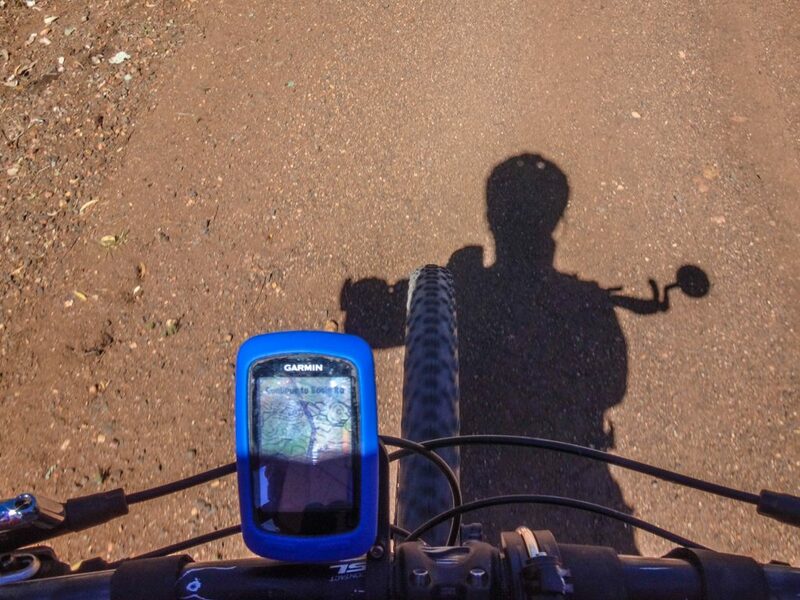 My GPS said we’d done about 95km. Peter noticed I was struggling. Rather than console me, he just talked about his work plans. I knew he was kindly trying to distract me – and it worked. I listened and caught a glimpse of his passion. He’s got some great ideas. I still hurt, but it didn’t matter as much while we talked. Although the road was flat, the 30 knot headwind made it feel as though I was riding uphill. Peter pushed on ahead. I tucked in behind and tried to dodge the wind. As we arrived back at the cars, 100km clocked up on my GPS. This had been a big day. We rode one hundred kilometres in just under seven hours. During that time we climbed almost 1,500m in elevation and I burned about 3,200 kcal. 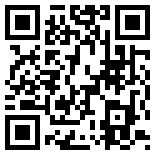 Technically, this is an easy ride – I’ll rate it 7.5 out of 10 on the tough-o-meter. But it’s gruelling to go out-and-back in a day. 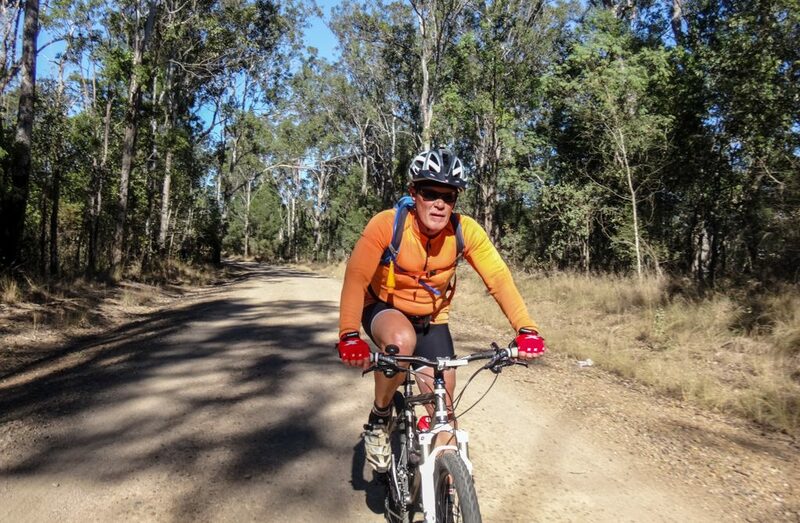 We can ride 40km from Nanango to Wondai on dirt roads and tracks in about three hours. 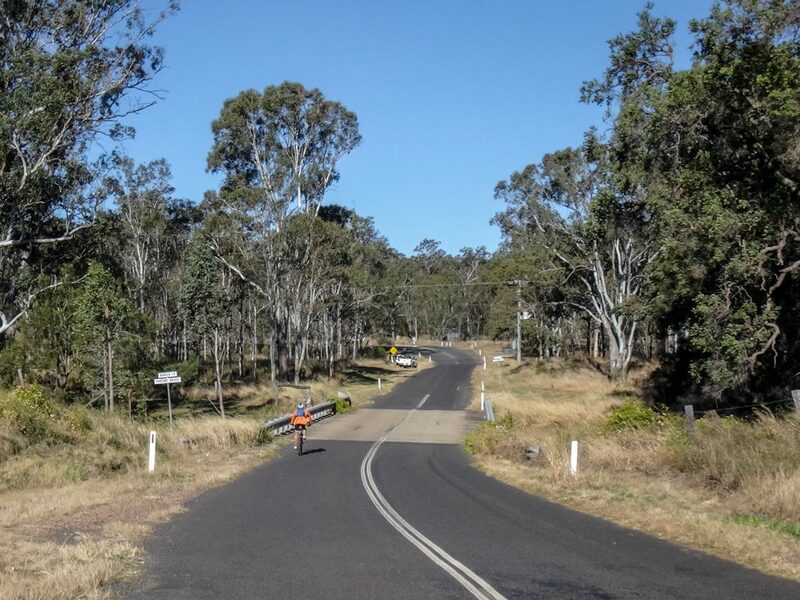 Alternatively we could also ride 45km between Nanango and Cherbourg in the same mount of time. I would avoid both of these routes after heavy rain. 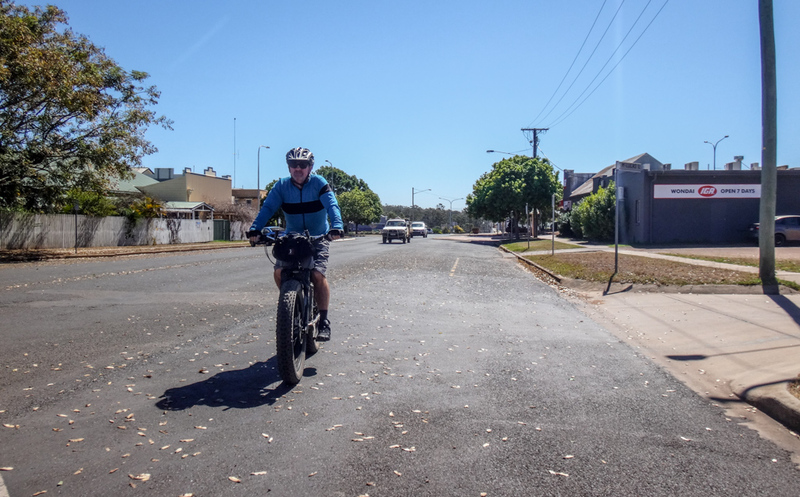 The black mud at the southern end of Old Wondai Road would be horrible. 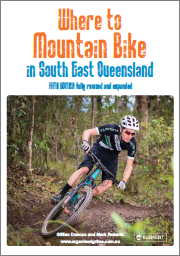 In good weather either of these routes would be an enjoyable way to ride through the South Burnett. Thanks Darb, Eric, Peter and Jason for another fun day out.